4/1/1941 Robert Sterchie was inducted into the Army in Chicago, Illinois via the draft; Sterchie’s number was drawn very early on before the United States entered World War II. President Roosevelt declared that every able-bodied single man over the age of 18 was to serve one year in the Army; however, as soon as Pearl Harbor was bombed on December 7, 1941, no one was allowed out of the Army until the war was over. 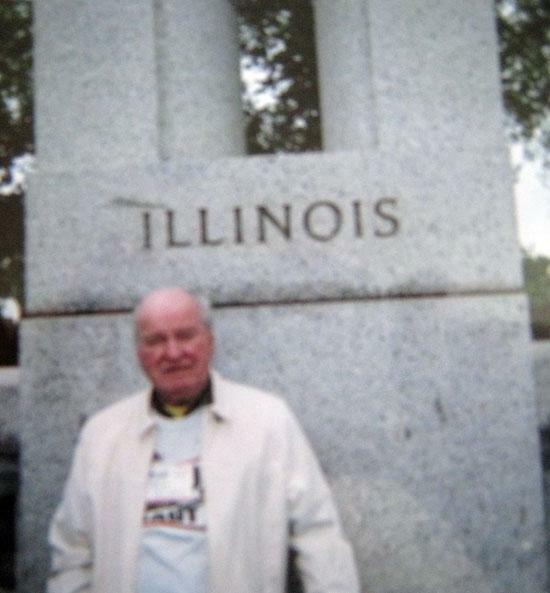 4/2/1941 Robert began his basic training at Fort Sheridan in Illinois. 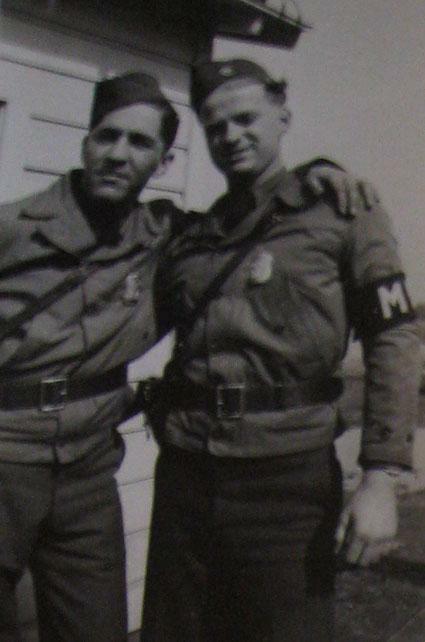 5/1941 Robert was assigned to the Head Quarters Company, Fort Sheridan, Illinois as a Corporal. 1942 Robert carried a revolver in the Military Police but later upgraded to the Colt 45. 4/15/1942 Robert married his wife, Ruth Turnquist, and was stationed at Fort Custer in Michigan, serving in the Army. 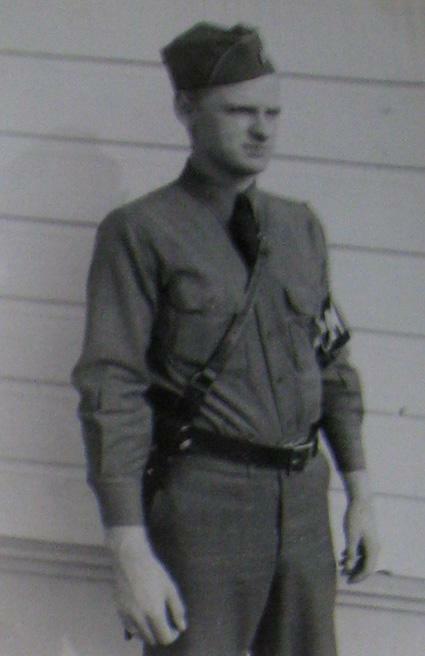 11/1942 Robert attended Officer Candidate School (OCS) Provost Marshal General School, Fort Custer, Michigan for 90 days. Robert’s wife Ruth convinced him to enter the OCS school even though he thought it was not a good idea, because at that time, the only way he could live on post with his wife was if he was an Officer. Of course their plan did not work out very well because as soon as Robert graduated from OCS he was given overseas orders. Sterchie would later jokingly tell his wife it was her fault that he was sent overseas. However, in reality, his wife’s plan may have saved his life as he could have been assigned directly to front line combat had he not been an officer. Given the bleak statistics of survivors who entered the war in 1941, Robert really beat the odds by playing a major role in North Africa and making it to see the end of the war in 1945. 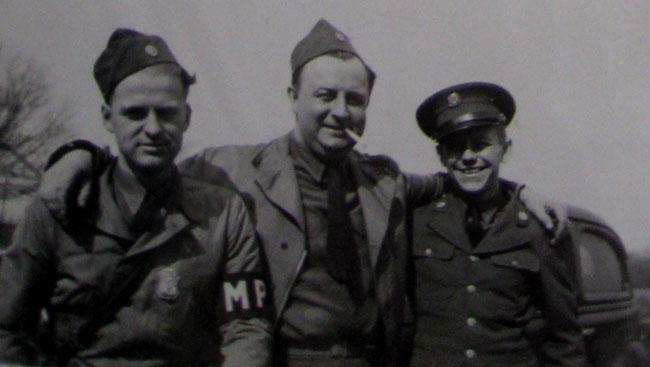 1943 Robert Sterchie’s closest friends were Mitchell Shemas, Peoria, Illinois; Gordon Fisher Milwaukee, Wisconsin; Captain Weber; Sergeant Dyer; Captain Klerk, Medical Officer, Kalamazoo, Michigan; Major Hamilton; Jim Lyons, Chief of Police White Plains, New York. 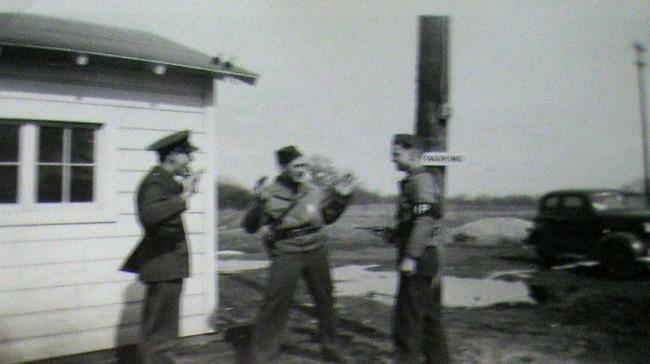 1943 Robert ate Spam morning, noon and night. The Army tried to disguise it the best they could with any and everything, but it was still spam, and to this day Robert has never again been able to eat it. The C-rations were pretty bad and the later improved K-rations were only a little bit better. 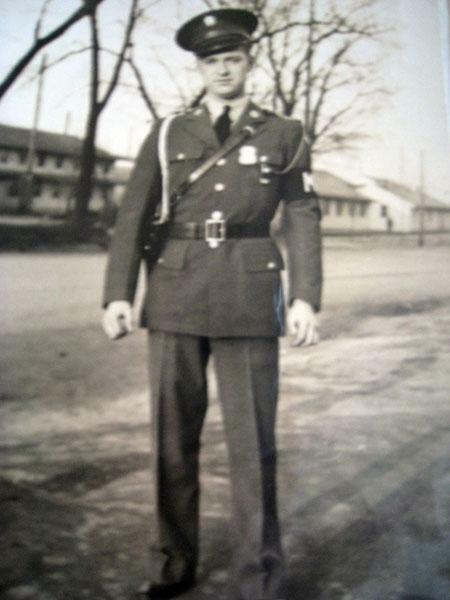 2/11/1943 Robert graduated from Officer Candidate School and was promoted to 2nd Lieutenant. He was given orders to immediately report for overseas duty after a 10 day leave. When one becomes an officer, one is discharged as an enlisted man and enlisted as an Officer, whereby a new military serial number is assigned. 2/21/1943 After his 10 day leave was over, Robert and his friend Ray Williams were dropped off at the train station in Chicago en route to Camp Kilmer, New Jersey. Once they arrived in New Jersey, under the cover of darkness, they went to Port Embarkation in New York City for overseas duty. It was the largest staging area for troops going over to Europe, which handled millions of men during the course of World War 2. Sterchie got on the SS Monterey, a troop ship, with 6,000 other men and did not see his wife for three years. The SS Monterey was pre-war luxury cruise ship which used to take passengers from California to Hawaii, New Zealand and Australia. The SS Monterey served from the beginning of the war by first bringing new American troops to Pearl Harbor and then bringing back some 800+ casualties following the Japanese attack on Pearl Harbor. 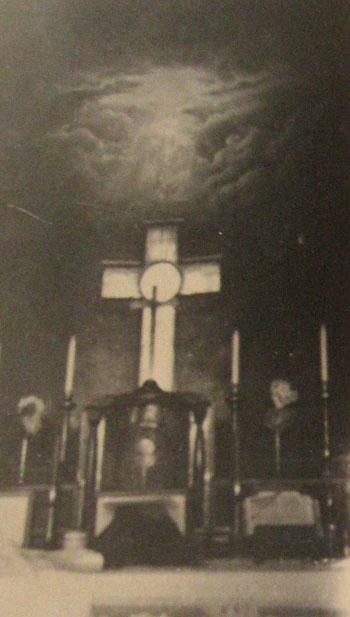 2/23/1943 The SS Monterey was out to sea after leaving New York Harbor under the cover of darkness and awoke the next morning to look out and see that the ocean was calm and looked like glass. The ship was waiting in line to form the convoy for the fleet that would cross the Atlantic. There were aircraft carriers, battleships, destroyers, and every other type of ship in the Navy. Destroyers would surround and repeatedly circle the entire convoy throughout the entire voyage to Europe. Half of the convoy was going to England for the Normandy invasion, Operation Overlord, and the other half was headed to North Africa. The convoy would zig and zag every seven minutes so that the U-boats could not get a good target on the American ships. 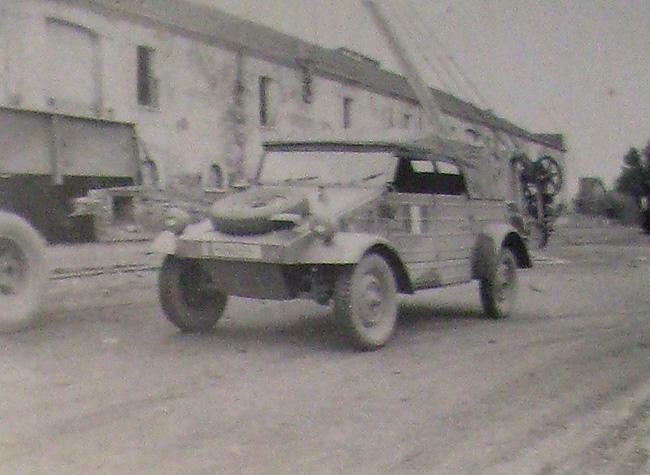 Robert’s convoy landed in Casablanca but could not dock because the German’s had bombed and decimated the port. The harbor was mined so there was only one clear path; every ship was lined up in single file for as long as the eye could see. Robert said he was “proud to be an American” on that day because of the power that was about to be released on the axis powers. 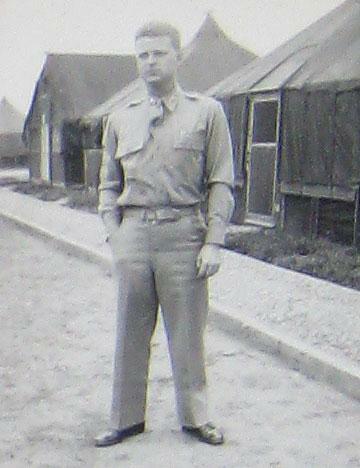 3/1943 Robert arrived at Casablanca, North Africa at the replacement depot to await his first assignment. 4/1943 Robert was assigned to the Headquarters 1054th Labor Supply Company for duty in Oran, North Africa where they would establish prisoner of war camps. General Patton would capture prisoners in Tunisia and send them back to Oran and Algiers. 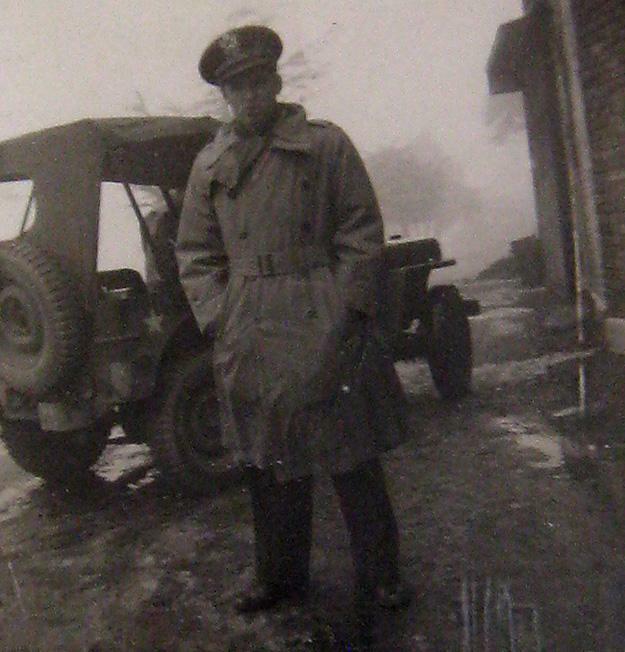 5/1943 Robert was often behind the wheel of a Jeep, which he loved to drive anytime he had a chance. 6/1943 German’s were continually bombing the Port of Algiers where the Allied invasion forces were assembling to take Sicily. Robert said the German’s were not very accurate with hitting their targets and the US would deploy spot lights and anti-aircraft guns firing illuminating the sky like the 4th of July. 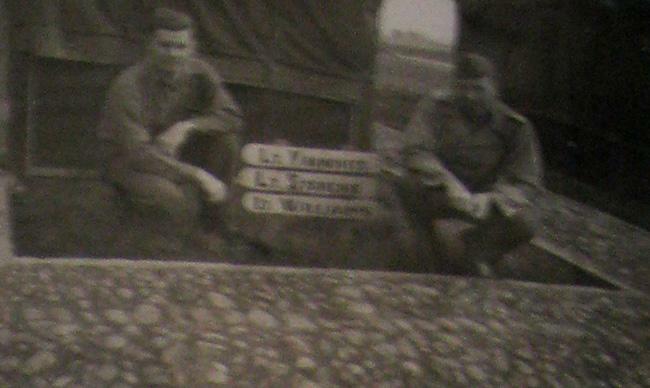 6/1943 While at the PW Camp 134 in Boufarik, North Africa, Robert slept in a tent with Lt. Ray Williams from Gahanna, Ohio and Lt. John Typovicz from Massachusetts. Sterchie was from Chicago and lived there almost his entire life but moved later in life to Westerville, Ohio which is only a few miles from Gahanna. 6/1943 One night at about 10:00 p.m. the air raid siren went off; everyone, sleeping in their underwear, had to put on their helmets and lay down in the field to try to avoid the shrapnel. Robert noticed that his bunkmate, John Yakmovits, was missing but couldn’t find him anywhere. The day before some latrines were dug about 4 or 5 feet deep and since it was dark when the air raid siren was going off, John fell into one of the latrine holes in his attempt to find safety while running and could not get out. Luckily the latrine hole he fell into was empty. After the all-clear signal was issued, Robert heard his distress call, quickly determined his location and was able to pull him out. 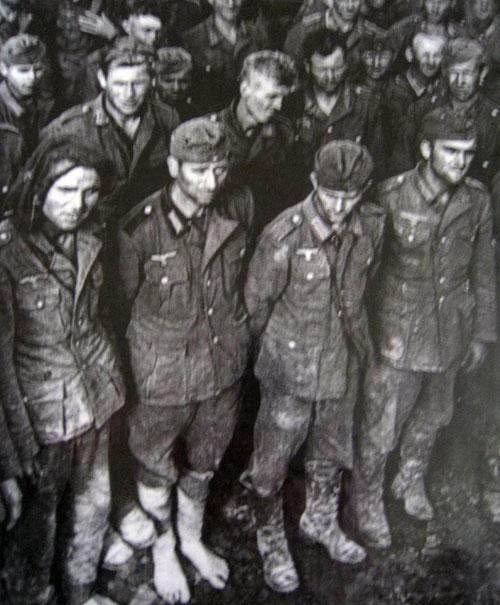 7/1943 Trains would come in to the stations full of Axis prisoners from the front lines. The 1054th would strip the prisoners down, burn their clothes, get them cleaned up, douse them with DDT to kill the bugs, and then issue them a new set of clothes. 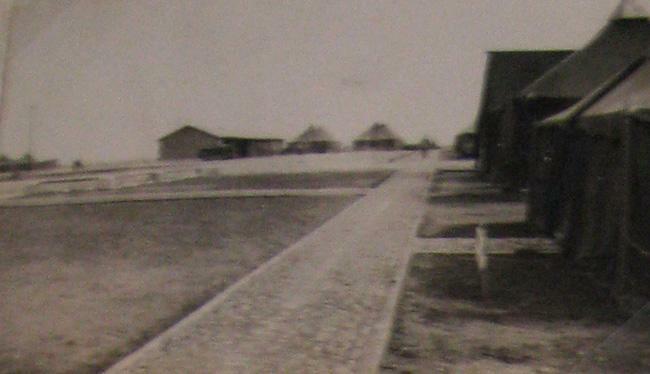 Many of the prisoners would actually then be sent to the United States to do farm work because after the draft, there were not enough men to man the fields. Throughout the war more than 400,000 POW’s would be sent to the U.S. primarily in the Southwest for field labor. 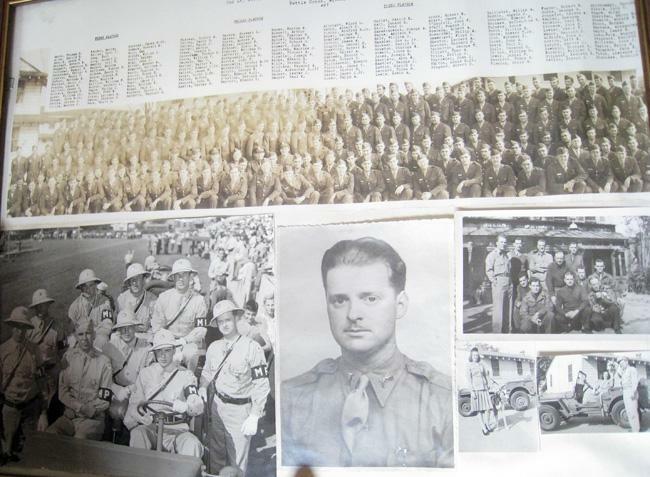 7/1943 Camp 134 was full of Italian prisoners of war. Inside the camp they built a church and everything that goes inside a church from scrap lumber. Robert said they encouraged the building as it gave them something to do and the Italians were more lovers than fighters, they never caused any problems. The German’s, on the other hand, were professional soldiers and when they were called to attention they followed orders but the German’s did not cause problems either. 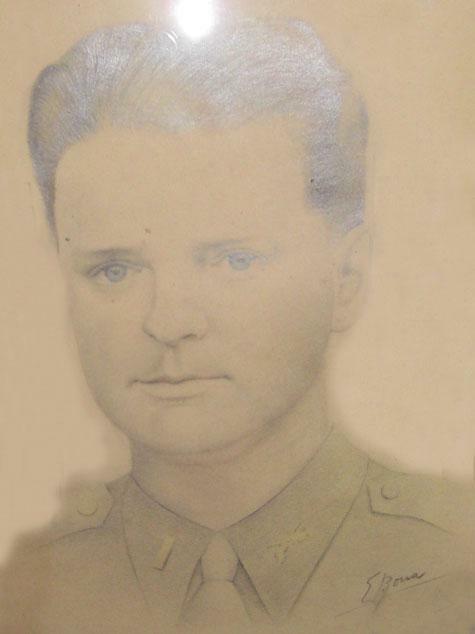 8/1943 One day when Robert was walking, an Italian prisoner said to him in perfect English, “Hi Lieutenant how are yeah?” Robert was perplexed and asked him how his English was so perfect. The man said he was from Brooklyn, New York; he was born in Italy but soon after came over to the US and became a citizen. Before the war had started his parents visited Sicily then the war broke out stranding them there. All males were forced to enter the Army so he was stuck. From then on, Frank Paserelli became Robert’s best interpreter. 9/1943 In Algiers, Robert had to go to Eisenhower’s headquarters (an old department store) to get some supplies. Robert was in the hallway talking to a guy and heard a loud holler. Robert turned to see what had happened, a private GI had been hit in the rear end with a swagger stick. The soldier turned around to take a swing at the person hitting him only to find out it was General Patton, the one and only, spit and polish himself. The soldier quickly changed his tune and looked scared to death, quivering, as Patton chewed him out about not saluting a superior officer. 9/1943 Before Robert left, his wife told him to look out for the ship USS Joseph Dickman APA-13 because her brother Roy Turnquist was on it. One day while Robert was in Oran, North Africa he saw some sailors and for the heck of it asked them if they had seen the ship. The sailors responded they sure do, we are from that ship and said they knew Roy because he was their radioman. Robert drove his jeep down to the ship and told his story to the officer where Roy came up to meet him. The next day, Robert picked up Roy in his jeep to have dinner with him at his camp near the Sahara desert; the Army guys were in quite a quandary trying to figure out how a Navy man had gotten way out there. A few days later Robert was on the move to Marseilles on board a ship and he once again saw the USS Dickman in the port of Algiers but this time he was denied access to take a boat to see him since they were leaving. A few minutes later, Robert noticed a tiny little boat headed towards his ship and to Robert’s surprise Roy had been able to get permission to visit Robert and they were able to spend a little time together before Robert left Algiers. 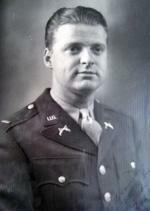 9/1944 Robert Sterchie was promoted to 1st Lieutenant in the United States Army. 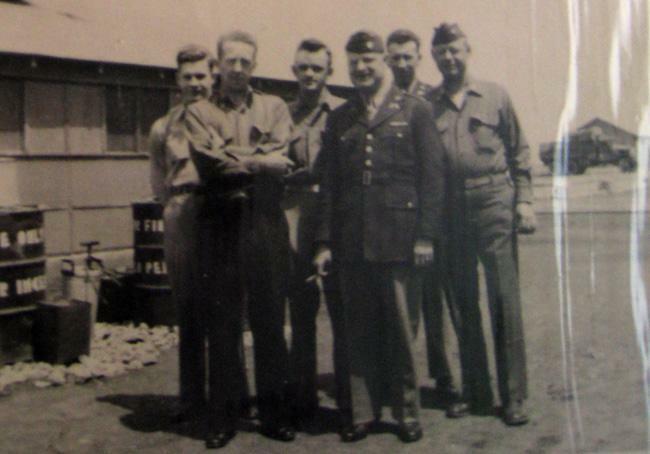 10/1944 Robert took a ship to Marseilles, France for duty with the 6829 PW Administrative Company. 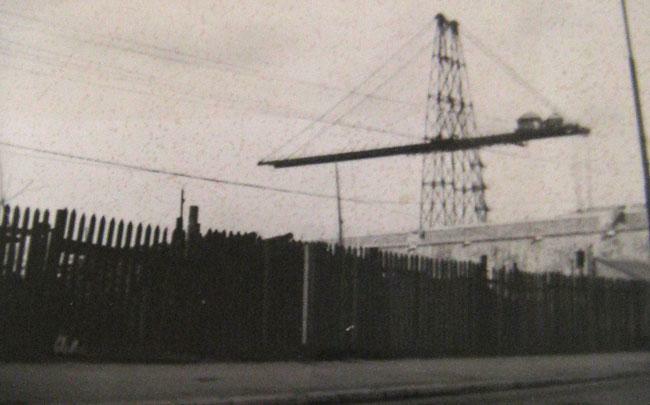 Again the German’s had bombed the port so the ship could not get into the harbor. The only way to get off the ship was to go down the landing nets of the side of the ship onto an LST. The Mediterranean was very temperamental that day rising and falling erratically, so Robert had to time his jump just right so that he did not fall into the water. While in Marseilles, Robert lived in a Hotel Restaurant Stoiniez where the Army would pay the rent to which the French had no problem accommodating the Americans. 1945 Robert and a friend of his took a jeep up to the French Rivera Cannes-Nice, France for some rest and relaxation. They stayed at the famous luxurious Carlton Hotel where there were fresh sheets, blankets, and a real bed, this was a first for them since they arrived in Europe and they enjoyed every moment. 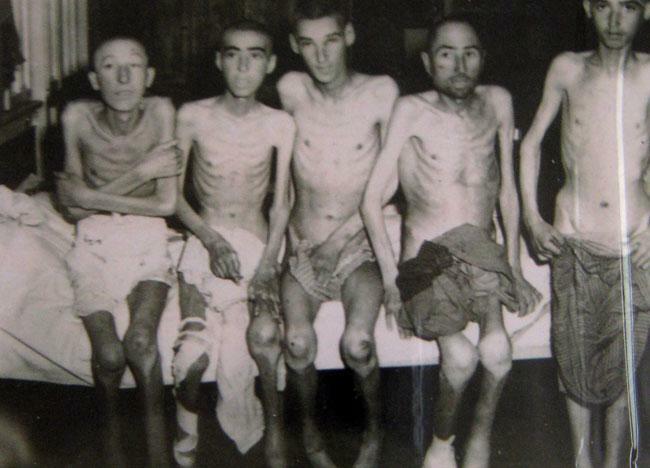 4/13/1945 Eisenhower at that time wanted as many pictures of the concentrations camps as possible for history to remember so that no one could downplay or ignore the atrocities the Nazis carried out. Eisenhower accurately predicted the future where it is amazing that some individuals will swear that the Holocaust never happened. Robert never personally saw the concentration camp, but he has some haunting pictures of them. Towards the end of the war, one of Robert’s photographer friends took some pictures at the Buchenwald concentration camp, per Eisenhower’s instructions, and later gave some candid photos to Robert. 5/8/1945 On May 8, 1945, the Allies declared Victory in Europe against the Axis powers, V-E Day. 6/1945 Shortly after the war ended, Robert had to go up to prisoner of war camp in Lyon, France to take a group of Italian prisoners back to Milan, Italy to repatriate them with just two soldiers assisting him. He took 400 prisoners in some old World War I French 40 or 8 boxcars (40 men or 8 horses per car). Robert went through Switzerland then into Italy and as soon as they crossed over into Italy, the train stopped and all the soldiers kissed the ground. Robert was stressed and wanted them to get back on the train because he was responsible for ensuring that they all made it to Milan, luckily they all jumped back on the train without any problems motivated by the fact that they were going home alive. 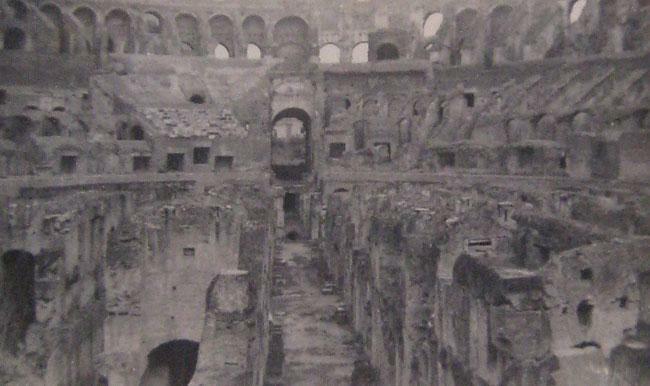 6/1945 After Robert had successfully delivered all 400 Italian prisoners back to Milan, Italy from Lyon, France, he was able to go to Rome and see many of the Italian historic sites and landmarks. At the top of his list were his experiences at Vatican City where he toured St. Peter’s Basilica and the Roman Coliseum. While he was in Italy, Robert went to the American Red Cross servicemen club where one could call home. For the first time in three very long and tumultuous years, Robert would be able to call home and talk to his wife! When he arrived however, they told him to come back around 10 p.m. to make his phone call on account of the time difference to the United States. Robert returned at 10:00 p.m. on the dot to make his call and hear his wife’s voice, the first thing Ruth wanted to know was when Robert was coming home, unfortunately Robert couldn’t give her an answer as he did not know at that time. 8/9/1945 2nd Lt. Fred Olivi was the Co-Pilot of Bockscar, the B-29 that dropped the atomic bomb “Fat Man” on Nagasaki, Japan. Robert and Fred were from the same hometown neighborhood of Roselin in Chicago, Illinois. 9/28/1945 When Robert was in Rome and many other times after the war he would write his wife who was back home waiting for him. It was called V-Mail, GI’s would write their message on a special piece of paper and take it to the military post office where it would be shrunk down to about 50% and mailed in a envelope for free back to the United States. During the war, however, Robert was unable to write very often before Germany surrendered in May, 1945. In August and September of 1945, Robert wrote numerous V-Mail letters to his wife Ruth, who I am sure waited at the mailbox each day looking for an update from her loving husband and word that he was safe. 10/1945 Robert was shipped how to the United States in October of 1945, five months after V-E Day. When Robert landed in New York harbor, he could not get off the ship due to a longshoremen strike, so they had to get off on a barge in the Hudson River. To this day, Robert is still not happy about not being able to get off that ship properly with the hero’s welcome they all deserved after fighting for his country. 1/16/1946 Robert was Honorably Discharged from the US Army on January 16, 1946. 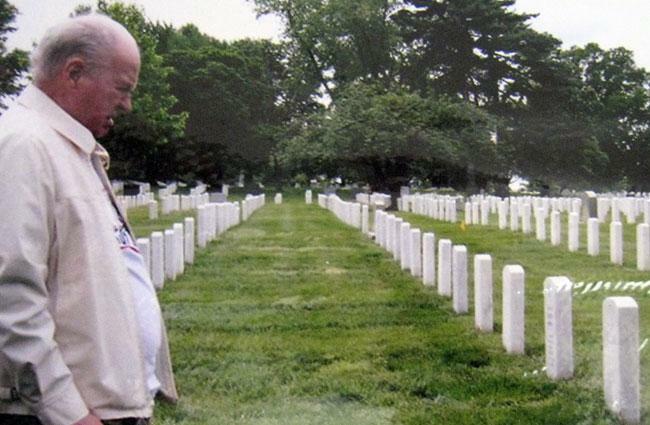 5/10/2008 Robert was privileged to be able to go an Honor Flight excursion. 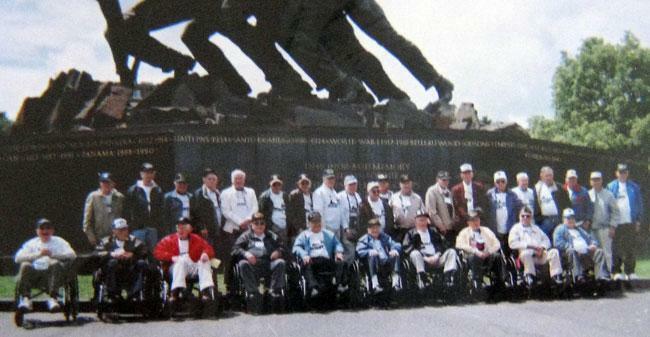 Honor Flight is a program setup to take as many World War II veterans to Washington, DC to visit the memorials for free. Many cities throughout the country have programs setup to fly veterans to the World War II Memorial and surrounding commemorative monuments. Robert met Bob Dole during the visit in May. Robert made a few new friends on his Honor Flight, in particular, a Navy veteran Paul McMurray from Buckeye Lake, Ohio. World War II Memorial. Many soldier's have their wife buried above them in the cemetery. 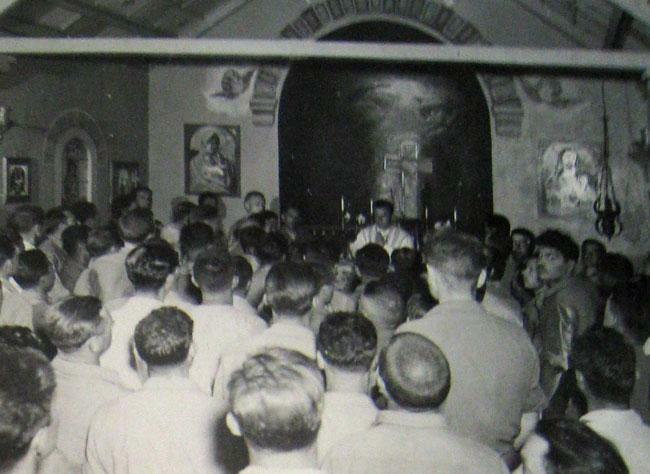 Inside the Church built at PW Camp 134 in North Africa by Italian POW's. 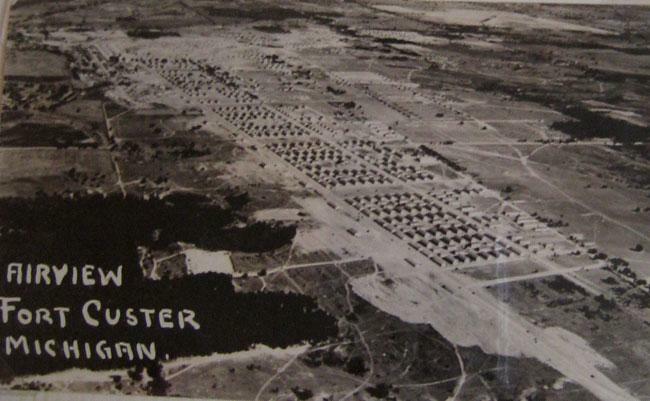 Air view of Fort Custer, Michigan were Robert went through OCS and MP post duty. 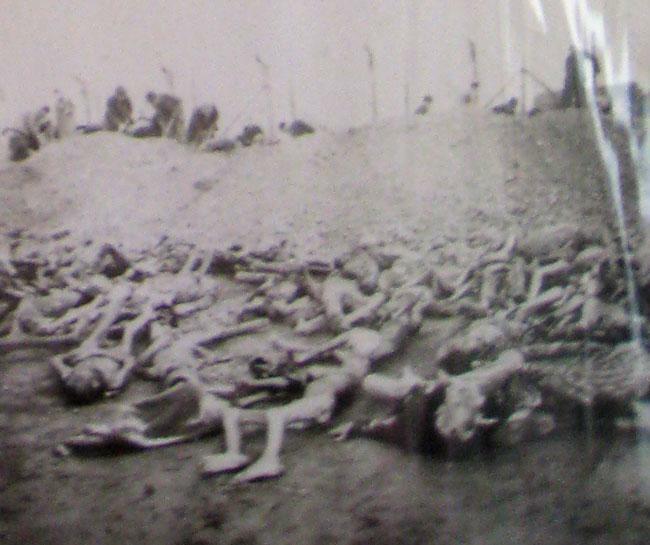 Dead bodies of Buchenwald holocaust victims. Colosseum in Rome, Italy 1945. Notice the water standing. During historic times the Roman would have Naval battles inside the Colosseum. Tent Robert shared with two other people Lt. Willams in Boufarik, North Africa. 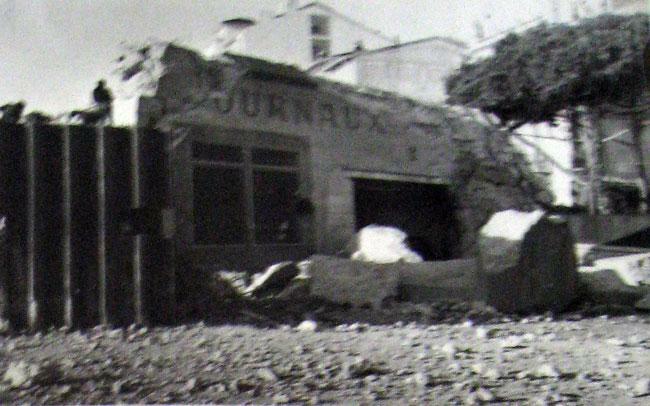 Marseilles, France bombed by Germans in World War II. Bridge half blown up by Germans in Marseilles, France. 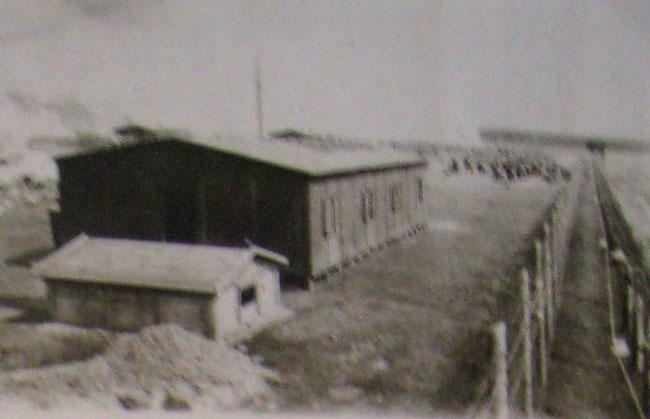 Tents at PW Camp 134 in North Africa. 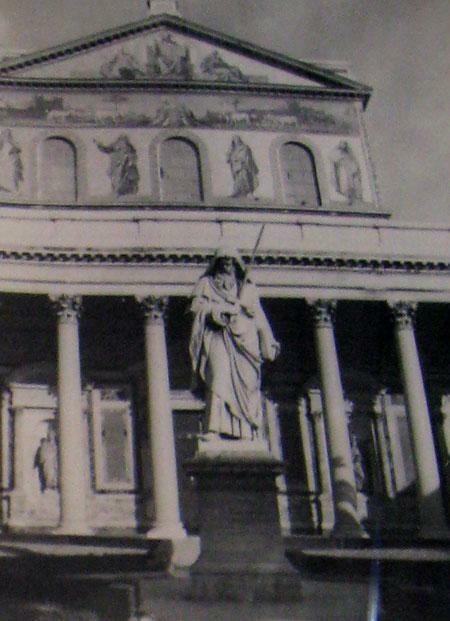 St. Peters in Rome 1945. 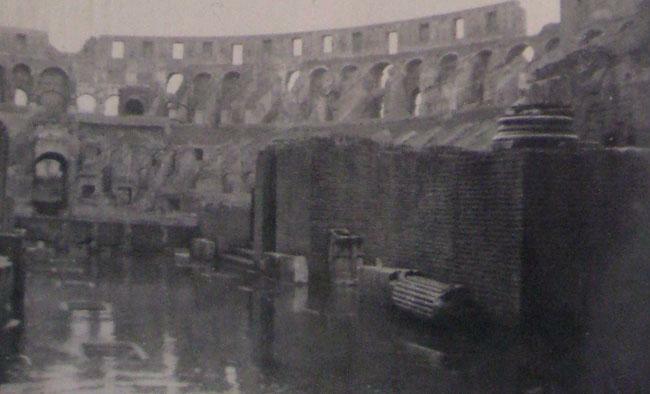 Roman Colosseum in 1945. When Robert took the prisoners back to Italy he was able to stop and see the sites. PW 134 Church built by Italians. 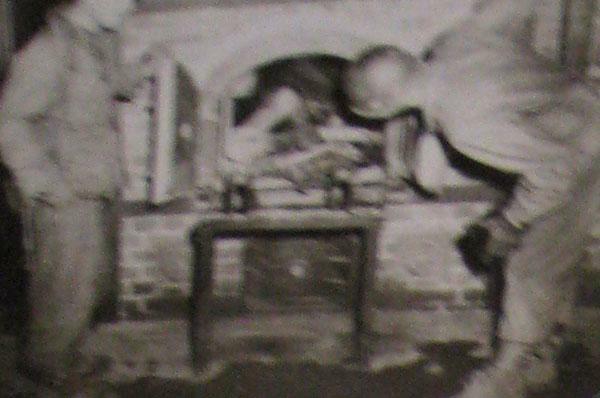 There were many skilled craftsmen among the prisoners. World War II Memorial in DC. Robert was from Chicago, IL. 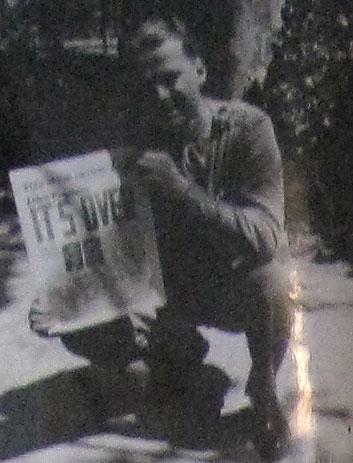 Robert holding a "War is Over" newspaper. Robert had not seen his wife for three years by the time he was able to go home. 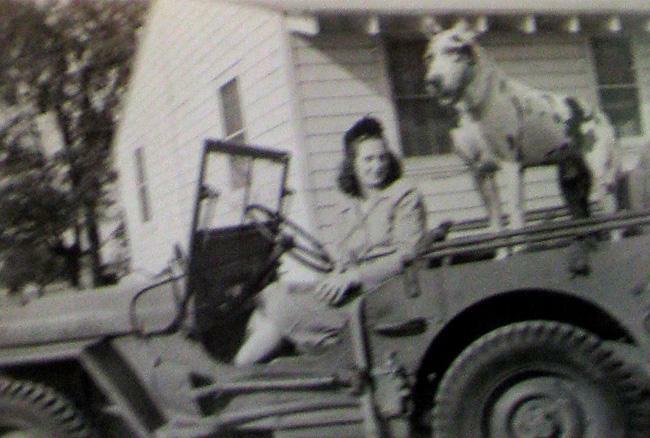 Robert's wife Ruth sitting a Jeep with the Captain's dog. 6x6 in Boufarik, North Africa PW Camp 134. Marseilles, France 1945 while on a liberty pass to the French Riviera. German coastal defense at Marseilles, France. Church built by Italian POW's from scrap lumber. Ft. Custer. Robert is on the right. An Italian POW drew this picture of Robert. Honor Flight from Columbus, Ohio. The honor flight sends World War II veterans to the memorial for free so that every one of them has an opportunity see it. Playing around at Ft. Custer. Hold using a revolver. The MP's were still carrying revolver's for post duty but soon later upgraded to the Colt 45. Ft. Custer graduated class of Sterchie. 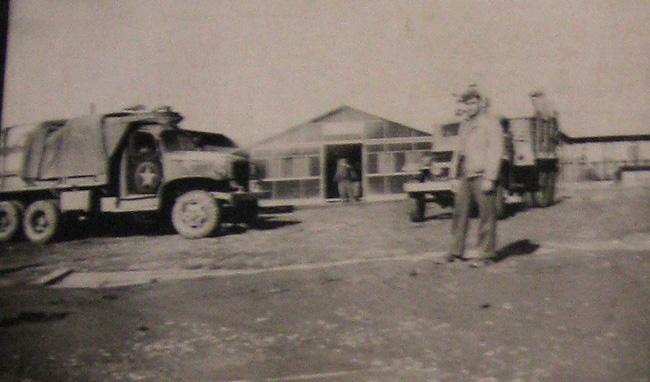 PW Camp 134 in North Africa. 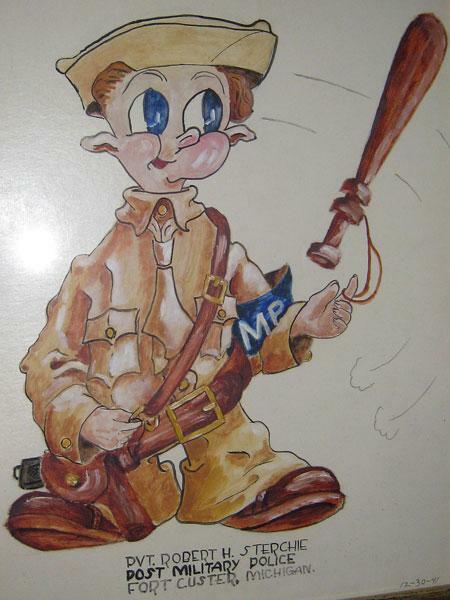 Picture drawn for Robert on 12/30/1941 at Fort Custer. Fort Custer, Michigan with Friends. 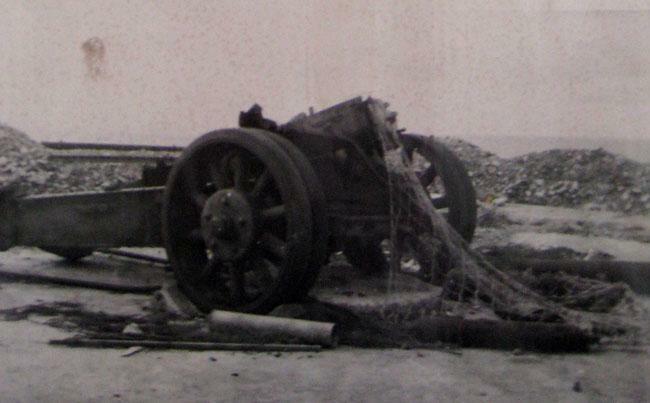 Captured German Jeep they used. 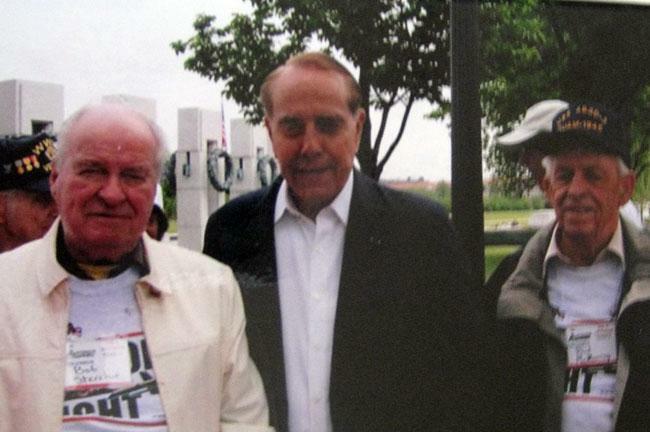 Bob Dole and Robert Sterchie in Washington, DC part of the Honor Flight for World War II veterans. April 13, 1945 liberation of Buchenwald concentration camp. Sterchie's friend was a photographer and since all photographers were ordered to take numerous pictures of the Holocaust Robert was given some pictures..